Just remember that it's not a primary source, so take its specific figures with a grain of salt. But yes, it's a very handy resource. Dracos and superdracos aren't on that list. this is really an off the wall idea. Only NASA could pull off the EVA's and repairs. I had the good fortune to have some time avai to watch many hours of the last repair mission. It so impressed me. Wonder if "all" the hours video of the mission are available ? IMHO, It was NASA, the Shuttle etc. at its best! Given how old the attached graphic is, and how easy these things are to generate, we have to keep plenty of grains of salt handy. Nevertheless, Mark Sirangelo has said servicing is a mission for Dream Chaser so it's interesting to guess how this might work. As far as DC goes, I've changed my mind on these. If we assume that this graphic is about right, and the pressure bulkhead can easily be moved forward to open up a mini cargo bay, here are some observations. + We now have a place to house the replacement parts uphill, the robotic arm can be safely placed within the bay, and the system has the ability to return parts. + Such a craft could only visit the ISS unmanned as the crew can't get to the rear hatch. + For EVA you'd probably just depressurize the (smaller) cabin area. If having an IVA crewmember in shirt-sleeves during the EVA was valuable, then you'd repressurize the cabin immediately, and have to depress/repressurize to get the EVA crew back in. While this is wasteful, the extra O2 would surely be less mass than an airlock. What are some examples of unpressurized cargo they would like to send down? No need for an arm if it is unmanned. Name a piece of unpressurized cargo that needs to be returned and can be returned by this? It is null set or very small. The discussion of further manned servicing of Hubble is well and good, but is also very unlikely. Before the final (Shuttle) servicing mission was re-instated, a considerable amount of effort was made towards planning an unmanned servicing and de-orbit prep mission. Following the changes from the last servicing mission, it is now even more likely that *IF* any further mission to Hubble happens, it will be very much along the lines of the aborted plans for an unmanned servicing mission. I know of at least two companies that have solid capabilities and mission designs that would allow an unmanned servicing mission with a high likelihood of success. It wouldn't surprise me at all if at some point STScI could come up with enough funding and political support for a robotic mission, even with JWST upcoming. Particularly so if HST continues to hang on and operate suitably after JWST is launched. Jim, are you going to argue that there is never, ever, a need to bring back unpressurized cargo? There is no urgent need for this now, but some day in the future I think it will be developed. If the need did arise soon, of the commercial crew vehicles, DC seems best suited to this because its pressurized crew module can be more easily shortened to open space for a cargo bay. And it's also the only vehicle where the addition of a suitport looks straightforward. Do I think this will actually happen? No, I do not. And to state the obvious: when the Shuttle was flying we made use of the return ability several times. I'm sure others can list more than me, but from memory: pump modules, EVA tanks, MISSE experiments, Hubble instruments. Why do you assume they're saying Dragon isn't well suited to satellite servicing? It is possible for both vehicles to be suitable isn't it? 1. Jim, are you going to argue that there is never, ever, a need to bring back unpressurized cargo? 2. There is no urgent need for this now, but some day in the future I think it will be developed. If the need did arise soon, of the commercial crew vehicles, DC seems best suited to this because its pressurized crew module can be more easily shortened to open space for a cargo bay. 3 And to state the obvious: when the Shuttle was flying we made use of the return ability several times. I'm sure others can list more than me, but from memory: pump modules, EVA tanks, MISSE experiments, Hubble instruments. 2. Just that DC is illsuited for the task. I was just referring to the occasions SNC brags about the servicing capabilities of own vehicle and not the competition. Care to fill in any details or reasons? 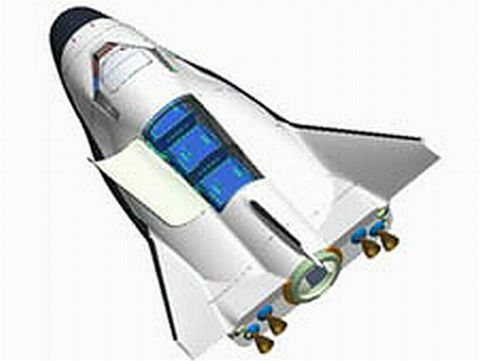 If the mission is unmanned, what about an agreement with USAF to use X-37B? When RLV's become economical for launching hardware, it should be economical to return some too. It seems a bit unobvious that RLV's are a requirement or even particularly relevant. Given a reusable spacecraft, I'd think the marginal cost of returning hardware from orbit would be extremely low. After all, if you're already up there, why return empty handed? Because the cost of the return capability is that much more, since you have to pay to get that return capability into orbit. The premise of the discussion is you have a reusable spacecraft to start with. Of course, I'm assuming that if the spacecraft is reusable, that it returns to Earth. It wouldn't apply to something like a GTO/GSO taxi, but I don't think that's what we're discussing. Anyway, apart from SSTO, whether the launcher is reusable or not has nothing to do with the spacecraft being reusable. Depending on the mass/value tradeoff for a particular mission, it doesn't seem inconceivable that a RLV would be sacrificed to get a heavier mass into orbit. SpaceX estimates a 40% payload penalty for launcher reusability. The cost of reusing DragonLab vs not is roughly the weight of the parachute and having a ship go out to pick it up. It does depend, because the ability to return equipment and the extra weight penalty to make that equipment repairable, etc, has to come out of a very expensive expendable launch vehicle of around $10,000/kg to orbit. Within the capability of the launcher, the marginal cost of a Kg to orbit is not anywhere near $10,000, it's probably closer to $200. Once you've launched the first 5000Kg, the next Kg is pretty cheap. Notice that SpaceX prices their launches by the launch, not the Kg. That means that as long as the mass to orbit stays within the launcher capacity, the marginal cost of launching any return racks not already installed is zero. For dirty laundry, it may still not be worth doing. For examining why a piece of life support equipment failed early, or getting back a protein synthesis lab to be modified and reflown, it's may very well be. As far as if repairability adds mass, I'm doubtful that much equipment is put into orbit that can't be factory disassembled. Obviously there are expendables, but even for failed equipment that isn't going to be reused, it's sometimes very instructive to take a close look to see what happened. After all, if you can double the on orbit life, you don't have to fly so many.